When pulling the power plug from my Dell Inspiron 6400/E1505 running Hardy Beta I loose sound in last.fm and flash videos. 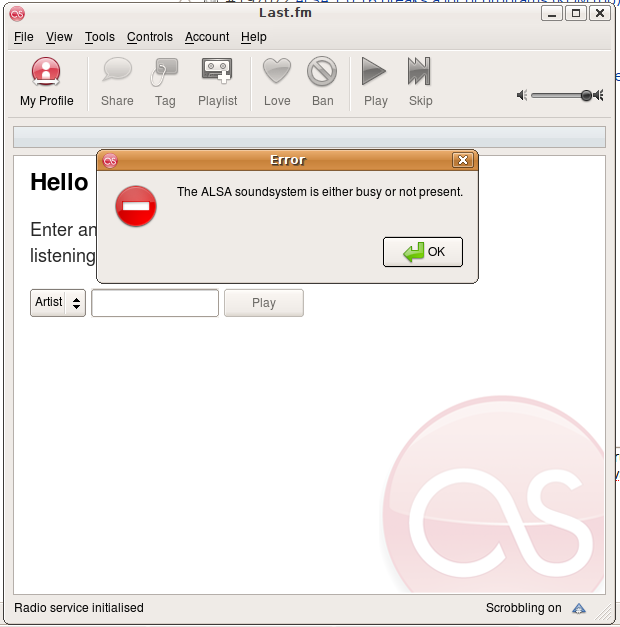 All other sound sources (movie players) work, but last.fm player says alsa is busy or unavailable (screenshot included). Flash movies don't complain, but no sound is heard until I reboot. The problem remains even after I re-plug the power cord. Also I've noticed that unplugging then re-plugging the power cord causes my wireless adapter (Intel 3945 with iwl3945) to act weird: when I normally download a torrent file, pinging the gateway results in 10-50 ms replies; after doing the unplug-plug sequence, pings go to 1000-1200 ms and stay there until I reboot. Also, I'll be attaching prints of lsmod before and after the unplug-plug sequence. Actually, everything stated above happens without the need to re-attach the power cord. Simply detaching it is enough to cause everything described earlier. Re-attaching it doesn't change anything back to the way it was before it was disconnected. It seems that killing and restarting gnome-power-manager or restarting X alltogether (with CTRL+ALT+Backspace) fixes the initial alsa problem.